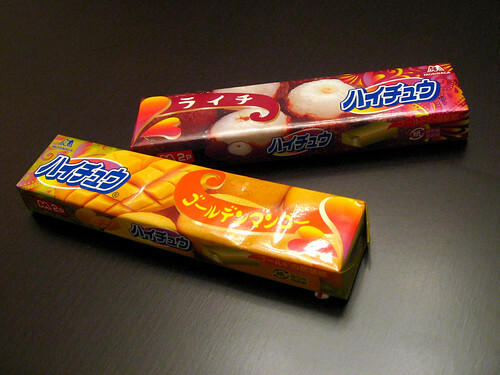 While there are many types of candy available, the most interesting ones seem to originate from Japan. In all colours, shapes and formats, I’ve been slowly making my way through the sugar stash at Sanko, J-town, and T&T. Focusing primarily on the soft and chewy varieties, my research has netted me three favourites. Off the top of the pile is Hi-Chew. For those of you who have never heard or experienced this, the closest US equivalent I can think of is Starburst – but with a softer, more gum-like chew and so many more flavours. The Hi-Chew Lychee and Golden Apple flavours are quite compelling, as well as giving one a longer and drawn out experience that is characteristic of the Hi-Chew brand (read: it’s really chewy and soft). Both lychee and apple flavours are really bright and make your mouth water. And that leaves my absolute favourite candy for last – Puccho Cola. With bits of gummi and effervescent candy embedded in a chewy caramel exterior, this is a multi-textured candy that both tastes and mimcs the effect of cola – but in its own unique candy form. Again, that less tooth-breaking chew inherent in many N. American candies on the shelves and more of that soft, but typical candy-chew. I like my sweets, but candies had never been my thing, growing up in Canada. Chocolate and cakes, yes, but the yen was never for a pack of skittles or a bag of taffy. Thankfully, access to varied and more interesting candies are just a quick trip to your local ethnic grocer. my gf got me addicted to the puccho candies. i like the muskat flavours. I’d advise to skip the cheesecake one. it sounds good, but it kinda smells like feet. lol, muscat is indeedy yummy, but my favourite is still cola! Okay now I’m freaking out, LYCHEE HI-CHEW?! I’ve been searching for these!! I used to have them when I was a kid but T&T doesn’t seem to carry them and when I asked they said Hi-Chew stopped making them?! I know this is an old post but do you know if they still sell them? Sanko? Please say yes because I need lychee Hi-Chew back in my life!